Dr. Shanon Brooks is giving us the chance to attend ReValue America right here in Utah. His free class was a few weeks ago, and then the real study begins. Our first class can be attended on Friday, July 30 from 5:00 – 9:00 p.m. For more details, contact us here. Don’t wait. This is an excellent opportunity to be mentored in the classics. Once you have attended the free class it is time to get busy and start the real work of changing our country. This 18 month course, called The Foundations of Liberty, will take you step by step through classics, we have discussions, and even simulations. This is the best way for a busy adult to get in the kind of education that will make a difference in our country. and A Thomas Jefferson Education. Next we dive head first into The Roots of American Order. We can only put 50 people in these classes, so please sign up now. You will be expected to read and participate in class, but this will be one of the best educational settings you’ve ever encountered. Many people familiar with The STAR Forum know that I am a huge fan of the Cycles of History. Here is a quick look at the Tytler Cycle in a video. COME JOIN US, and help Save The American Republic, by starting with ourselves, our families, and our community. FREEDOM CAN WIN! Many of my followers are not necessarily Glenn Beck fans, but recently Glenn Beck said something on his radio show that I would like to share with you. His words represent the direction I have wanted this 9.12 project The STAR Forum to turn. We must be educated to win. We must change our very lives and decide we are willing to make sacrifices so that our children and grandchildren can live under freedom. We must receive a liberal arts education. Those that know me are aware that this has always been my goal. While the politics of this movement can be exciting and interesting, and important, we must not forget the things that will change our society from the bottom up. We must begin educating ourselves and our families, changing the way schools teach, and how they prepare our children for the world we live in. Skills will never be enough. We must have amazing young men and women of real character. We have been raised ourselves in a society that has not taught us to think sensus plenior, we have not learned to look to the great minds of the past that our founders studied. We are in a 4th Turning, and honestly time is running out. What an exciting and important time to live in. We will only make a difference if we are educated. This education can come many ways, but I have one solution, that although costs money, will not break the bank. I have invited Dr. Shanon Brooks, who holds a PhD in Constitutional Law to begin to mentor us through a series of lectures beginning on June 26, 2010. We only have room for 50 students. This first of 5 lectures will open our minds and begin the process of all of us thinking on a different level. To find out more about the Foundations of Liberty Seminar #1 , click here. GLENN: I’m going to say some things here that are not going to be for everybody, and that’s fine. And if it means that I shake some listeners loose, that’s fine. I’m charting my own course and I am trying to, I’m trying my hardest to preserve the voice of — or a voice of man a’s freedom, individual freedom for as long as possible. And I’m also trying to create other voices that understand the difference between individual freedom, individual rights and human rights. There are two kinds of rights and they are both important. But I’m going to chart a different course than others. Others are going to say get involved in politics and everything else. And while I think that I don’t have any problem with that, not a lot of people have been doing as much research as I have for the last five years. And a lot of people, I mean, everybody has gotten this wrong every step of the way. They’ve had pieces of it here and there but I don’t know anybody that has had the majority of pieces. We have. This, I don’t even know what you would call it. This plan, this hijacking of our country. It didn’t start with Obama. It’s not about Obama. It’s not. This started a long, long time ago. And you are much farther behind than you think you are. I know. The only thing that gives me peace and comfort is I know what this land is. I know whose rights these are. No sword formed against thee shall prosper. He will destroy the devourer, not you. Not me. For our sake those who want to devour man’s individual rights will be destroyed. My guess is they will destroy themselves. It’s the way it always happens. These people are radicals. They are not rulers. However, I will tell you this, Cass Sunstein is the man that is wildly important. Because I see his fingerprints on almost everything now. So here’s my recommendation. The 9/12 project started a year and a half ago. I haven’t talked much about it because I don’t do anything with it myself. I mean, I’m not — I’m a proud 9/12er but I’m not involved in running it or anything else. This was yours. I will advise the 9/12 group, double your efforts. Get more people into the 9/12 project. Tea parties, while you play a valuable role, be very careful because you are not rooted in values and principles. What are your charting values and principles? 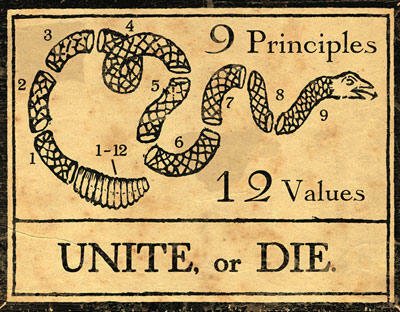 9/12 members, if you are not studying the values and principles and the founding fathers, it was set up as something different. It wasn’t a tea party. It wasn’t a political action committee. It was a preservation committee. As I saw it, it was a way for people to get together and learn and teach each other what values and principles were important. This is important because just like any kind of rights movement, there will be others just like with Martin Luther King, there was Malcolm X, there was William Ayers. Only one succeeded. People are going to be going through — when Europe begins to fall and you are seeing the very beginnings of it now, when Europe falls, the thing will come down, crashing down quickly and people are going to be herded into one direction. And it’s going to be a global direction. You need to be values and principles. You need to teach your children. You must see yourself — how many years have I said this? Wives, mothers, you must see yourself as Sarah Connor. You must. As Ronald Reagan said, if this country falls, where does the rest of the world go for freedom? But he also said this: This is the last stand. On the globe this is the last stand. And if this generation loses man’s freedom, this generation will not see it again. I just read a letter from Thomas Jefferson, between Thomas Jefferson and James — or John Adams, 1823. I read it this morning. In it Thomas Jefferson said, if they lose freedom — speaking of us, future generations, if they lose freedom, there will be rivers of blood back and forth, back and forth. There will be a first attempt and a second attempt and a third attempt. And maybe after the third attempt they will win it back again. You must see yourself as a guardian, as someone who will preserve what is true and pass it on and not be a guardian — not be a militant but a guardian. A leader. Where are the — there are plenty of minutemen. Where are the Washingtons? Where are the Franklins? 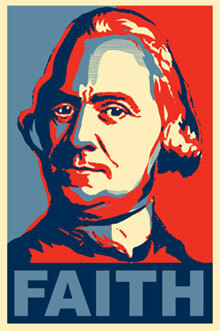 Where is Sam Adams? Where is John Adams? That is what the 9/12 project is. Not to create a warrior but to create great minds that understand it. To be able to create the next George Washington. That is your role. It may not be you. Find them. Teach them. Guide them. Shape them. Live principles and values. Almost no one in this country is. The next step, you must know ten people. You must know ten people out of your circle of friends in your area that think like you do. Know them. This Internet nonsense of a public utility and this speech that the president gave over the weekend is positively chilling, especially if you couple it with the knowledge that we have been trying to impart to you for the last year and a half about what they are doing with the Internet and control of language and control of — I’ll show you tonight at 5:00. It is positively horrifying. You say it can’t happen in America. I hope to God it can’t. But it might. It could. All they need is an emergency. Know ten people because those ten people know other ten people. There’s got to be lines of information. If they control everything, you must have lines of communication. But God, I can’t believe I’m saying this stuff. This is the territory of the insane. But you better prepare and then hope for the best. You must prepare a freedom library. You must have the books on paper, have them on paper. You must have the books that are essential. You must have the Federalist Papers, the Constitution, original intent. The 5,000 Year Leap, please, if you haven’t gotten that yet, please get that. You must know, if you are working on the Internet and you see something, don’t just e mail it. Screen shot it. Pull it off. Put it onto a DVD. Save it. I can’t tell you the number of things that we have gone back and they have scrubbed. Things are disappearing like you would not believe. Learn the truth. Live the life of our founders. Be a decent, righteous, forthright honest man or woman in all of your business dealings. Demand it of yourself. Demand a higher standard for your children and do it now. Your children need to know. Your children must be prepared. Your children need to know what is true, what is not, how to work, what merit is. And here’s the part that is going to seem so simple and everybody’s going to say no, it’s better to organize, it’s better to, you know, get behind a candidate. Look, you’ve got to do that, too. When Moses was out in the wilderness, my gosh did the Israelites just, they were constantly complaining, “It’s hot, I’m cold, are we there yet,” over and over and over again. And Moses got to the point to where he was like, okay, you know, God, just kill me, just kill me, I can’t do it anymore with these people. When are you going to do it? Because just kill me, I can’t take it anymore. God didn’t. At some point God was like, I’m sending snakes or scorpions, I’m sending fiery, fiery snakes, man, just kill you all; I can’t take it anymore. He told Moses, put one, put a symbol of one up on a stick and tell everybody to look at it. They will be fine if they just look at it. A lot of them died because they didn’t look at it. It’s too easy, doesn’t make sense. What is the message? The message is look to God and live. Look to God and live. Please, please. It’s not you and me. It’s our children. It’s man’s freedom. Look to God to live.